This is a fundraiser event for Jake Boulder so show up and help out an awesome guy and family! 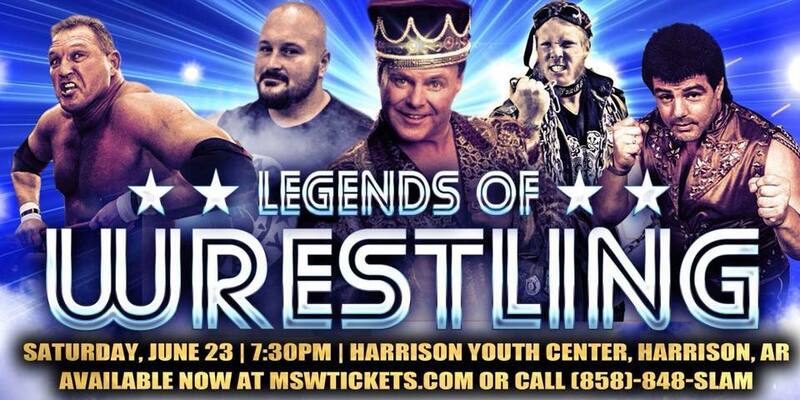 On August 20th, Michael Barry will be defending the Mid-States Wrestling Heavyweight Title against Jerry Lawler at MSW’s “Legends of Wrestling” event in Harrison, Arkansas. 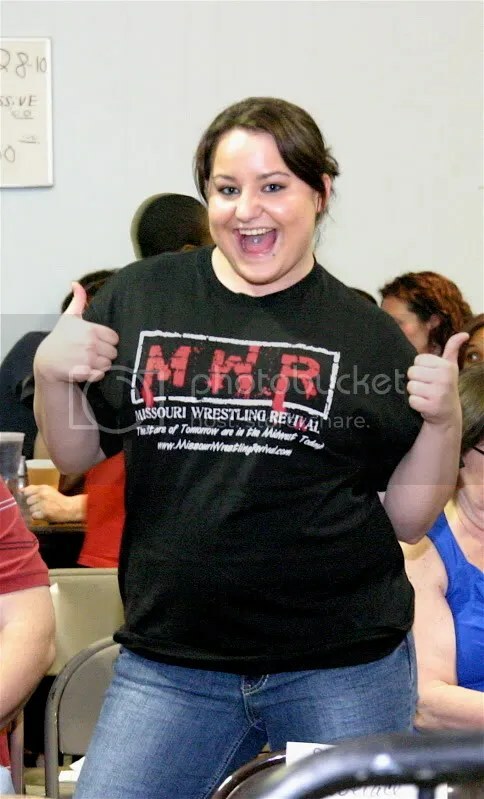 Mid-States Wrestling has posted a video from Lawler to the fans talking about his career defining moment and him winning 164 titles in his illustrious carrer. Lawler also said he is going to take Barry’s title and add it to his long list of accomplishments. For more info please check out my friend Mike Iles website OKLAFAN.COM with a great article called “The Scoop” Click here to check it out. 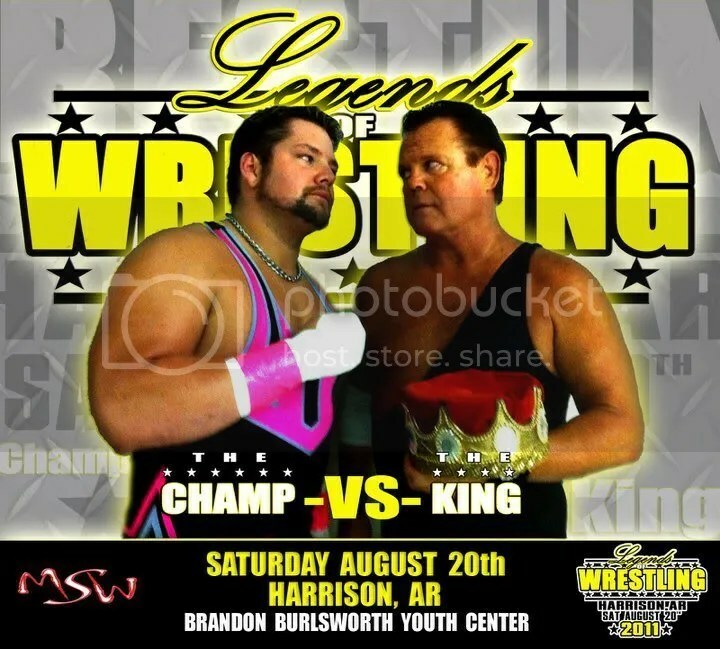 Saturday, August 20th at the Brandon Burlsworth Youth Center in Harrison, Arkansas, Mid-States Wrestling presents its first ever “Legends of Wrestling” event. In the main event, Heavyweight Champion Michael Barry defends the title against World Wrestling Entertainment Hall of Famer, and current “Monday Night RAW” broadcaster Jerry “The King” Lawler. Hailing from Memphis, Tennessee, Jerry Lawler got his start in pro wrestling in 1970 and is a legend, holding over 160 titles in his illustrious career, including the American Wrestling Association World Heavyweight Title. 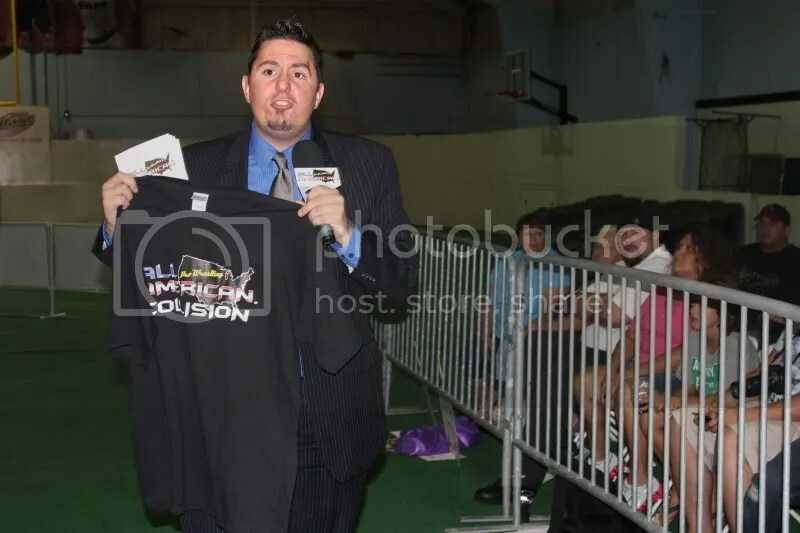 Michael Barry, has held the Mid-States Wrestling Heavyweight Title 4 times, more than anyone else in the company’s 8 year existence. This will be Barry’s biggest challenge of his title reign, and possibly his career. In other matches, “White Trash” Gary Gram takes on the homicidal, suicidal, and genocidal Sabu. 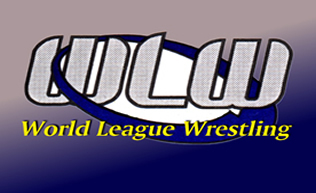 Gary Gram can be somewhat unpredictable in his matches, but is he ready for a wrestler the likes of Sabu. 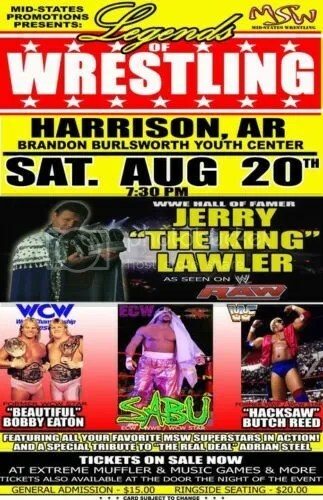 More importantly, is Harrison and the state of Arkansas ready for a wrestler the likes of Sabu? 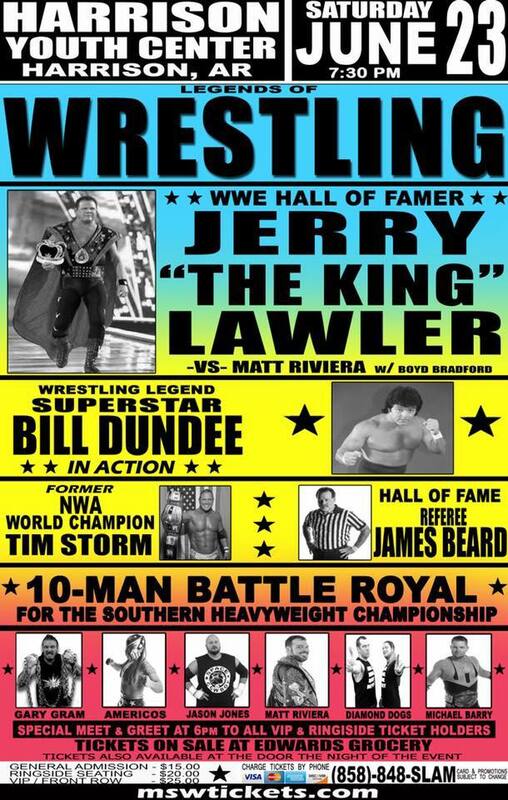 Other legends scheduled to appear include Hacksaw Butch Reed and Beautiful Bobby Eaton. 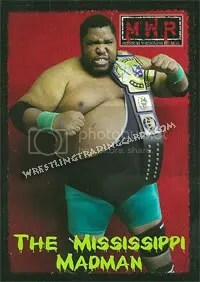 In addition to being a former Mid-States Wrestling Heavyweight Champion, Butch Reed has held titles all around the country including in Mid-South Wrestling where he held the North American Title twice, the Television Title, and the Tag Team Titles (with Jim “The Anvil” Neidhart), In the National Wrestling Alliance, Reed was also a multiple title holder winning the Central States Tag Team Titles (with Jerry Brown), the International Title, the North American Tag Team Titles (with “Sweet Brown Sugar” Skip Young) and the World Tag Team Titles (with Ron Simmons). Beautiful Bobby Eaton is probably best known for his days as a member of The Midnight Express. 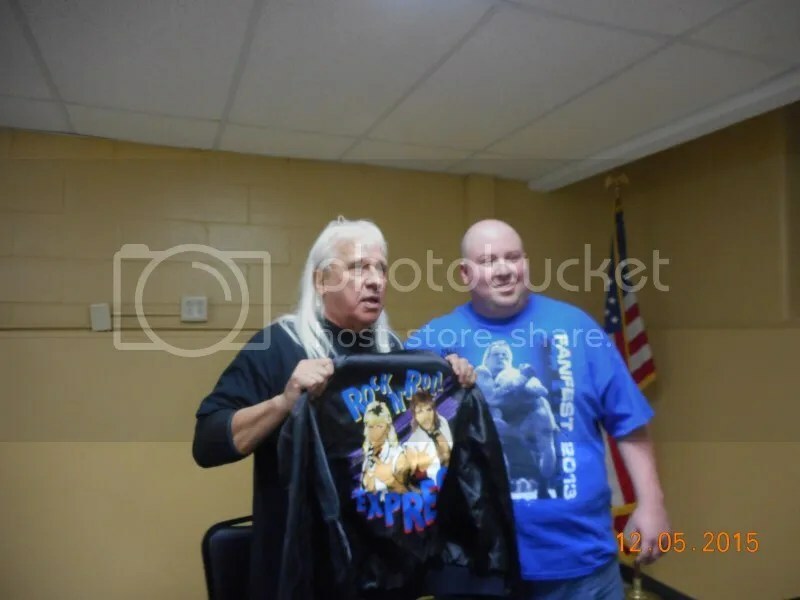 His partnership in that group with Dennis Condrey and later Stan Lane produced 2 NWA World Tag Team Titles, 3 NWA United States Tag Team Titles, Mid-South Tag Team Titles, and numerous regional tag team titles. In all, Eaton has held 31 tag team titles with 15 different partners. Arguably, he is the definition of a “tag team specialist”. But he has also held 19 singles titles in his career including the WCW Television Title. 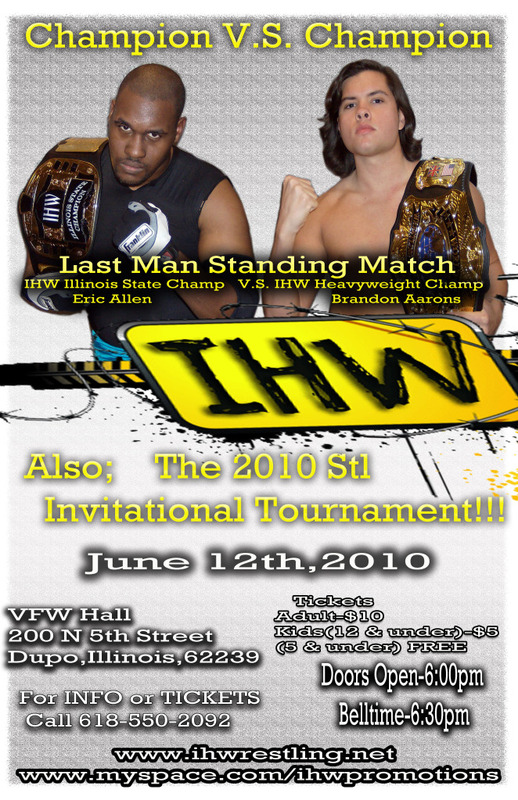 In addition to these legends, all your favorite Mid-States Wrestling superstars will be action including Independent Wrestling International Champion Darling Dustin Heritage, Southern Tag Team Champions Jim Fallon & Doomsday (with Stephen E), “The Space Cowboy” Jason Jones, SLUGG, and many, many more. 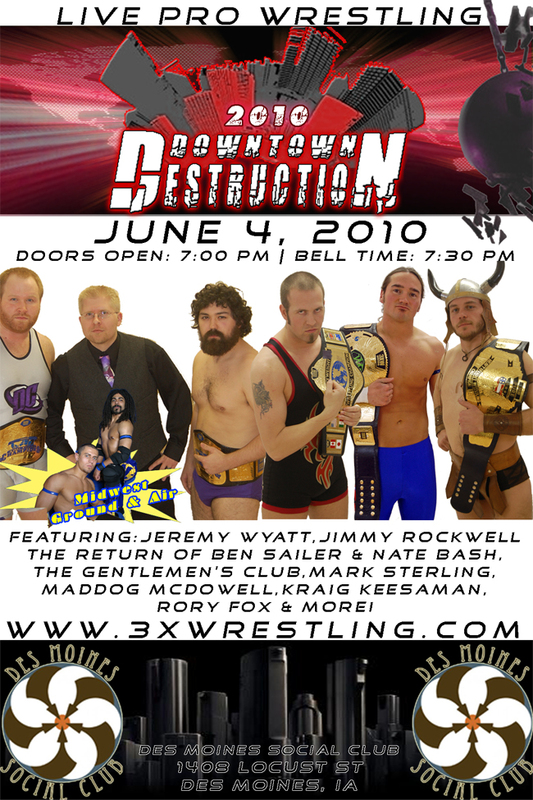 Tickets are on sale now at Extreme Muffler and Music Games & More in Harrison, on eBay, or at the door. Bell Time is 7:30pm. 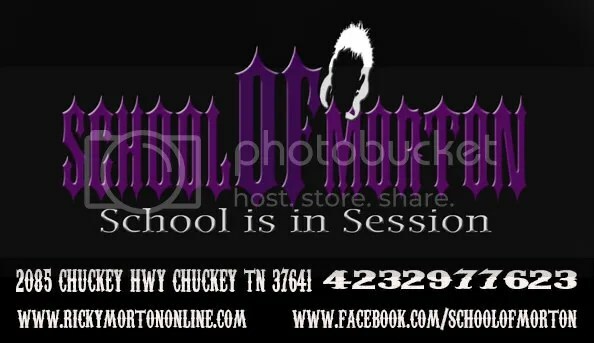 Also, check out our Facebook site at www.Facebook.com/MidStatesWrestling. Saturday December 6th in Rantoul IL, New Breed Wrestling Alliance delivers and early Christmas presents for Pro Wrestling fans when they bring 7 former WWE Stars. The show starts at 2:00 P.M. and tickets are only $10.00. Here is a brief rundown of the 7 former WWE Stars with the lineup for a night you wont forget. Jake “The Snake” Roberts is considered one of the most talented promo guys in the sport. He is the inventor of one of the most influential moves in wrestling history, the DDT. 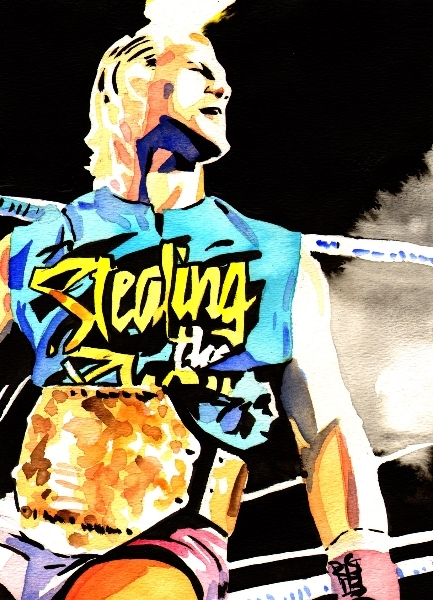 His classic feuds with Ricky Steamboat and Rick Rude are still talked about today. Jake often brings in a live snake to the ring which he would put on top of his opponents after knocking them out with the DDT to win the match. One of the most discussed wrestlers in the past 3 decades; you do not want to miss Jake “The Snake “Roberts. The Father of Randy Orton, Cowboy Bob Orton’s legacy in the sport has been cemented with the honor of being named a member of the WWE Hall of Fame. Nicknamed Ace by Roddy Piper, Bob Orton was Pipers body guard when WWE took over the world in the 80’s. Bob always wore a cast on his left forearm claiming he was healing from an injury during a 1985 battle with Jimmy Snuka, but opponents would have to watch out because Cowboy would in turn use the cast as weapon. The Honky Tonk Man is one of the most charismatic wrestlers ever to grace the sport. 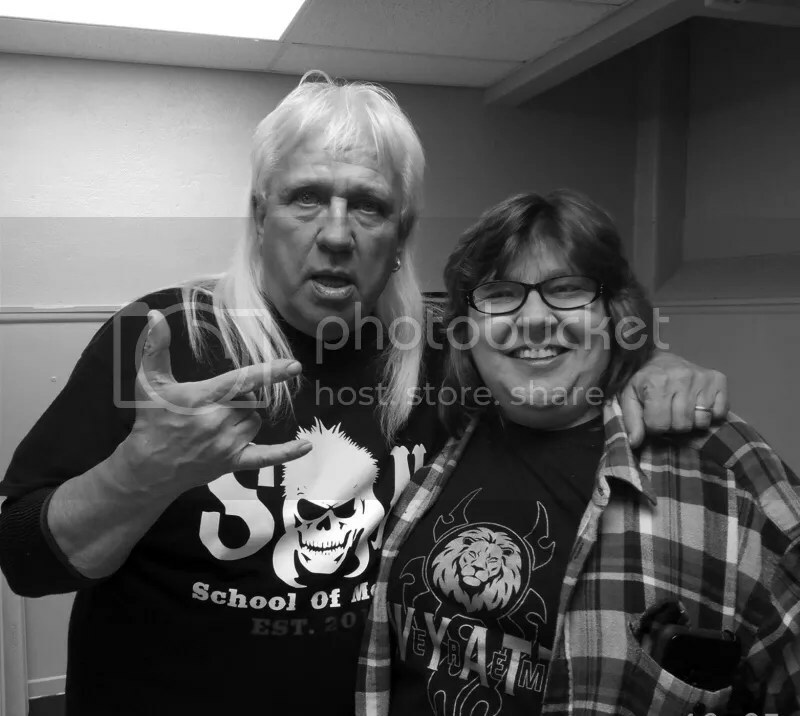 He has headlined major WWE arenas with around the country. The Honky Tonk Man will be the first to tell you that he is “The greatest Intercontinental Champion of All Time”. Defeated Ricky the Dragon Steamboat on June 2, 1987 and did not relinquish the title until 454 days later to the Ultimate Warrior. The Honky Tonk Man thrills the fans with singing his unforgettable entrance theme, “Cool, Cocky, Bad,”. Rosey is a member of the famous Samoan family, with Dwayne “The Rock” Johnson being one of his cousins. 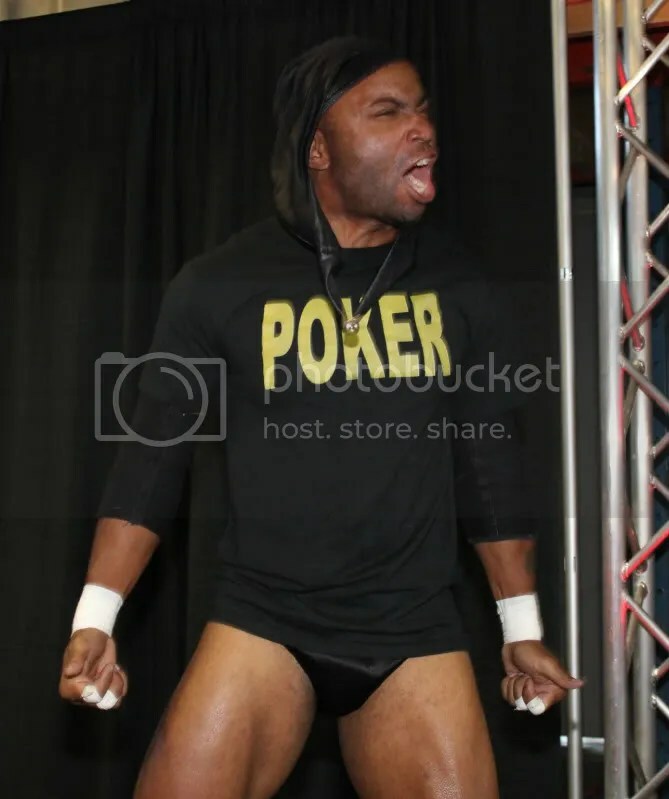 When the wrestler Hurricane “discovered” Rosey’s potential as a superhero, he christened him “Rosey, the Super Hero in Training”. The two would go on and win the WWE Tag Team Championship together. 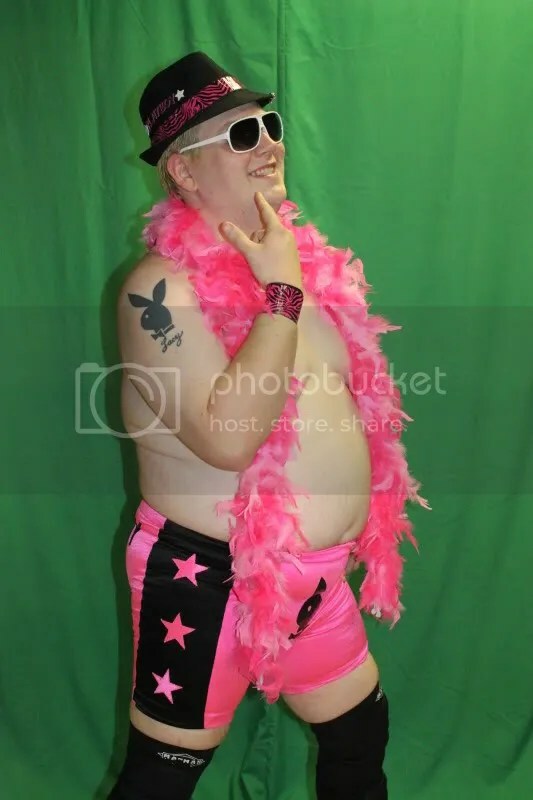 Since leaving WWE, Rosey has kept busy around the world. 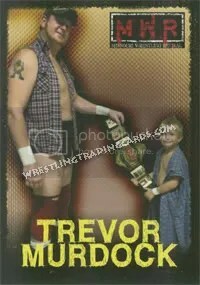 The Wild Eyed Southern Boy Tracy Smothers, is one to never back down from a fight. 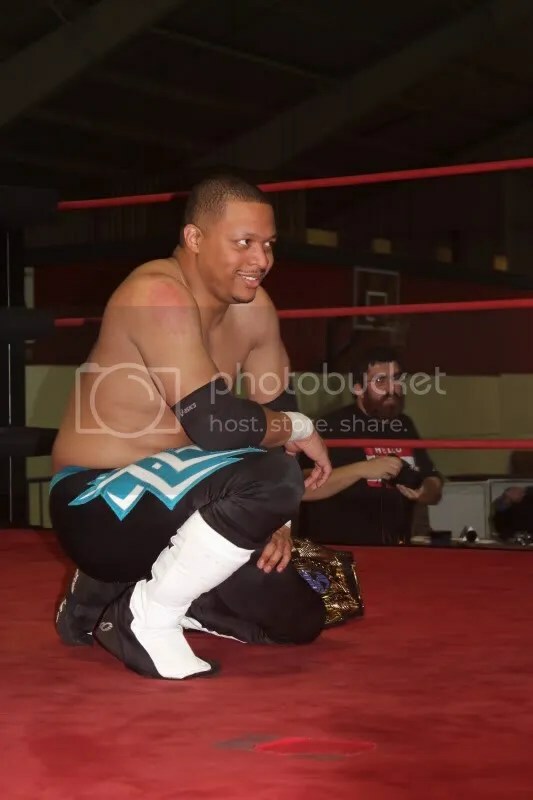 Tracy can get under wrestlers and fans skins alike with his actions and words. 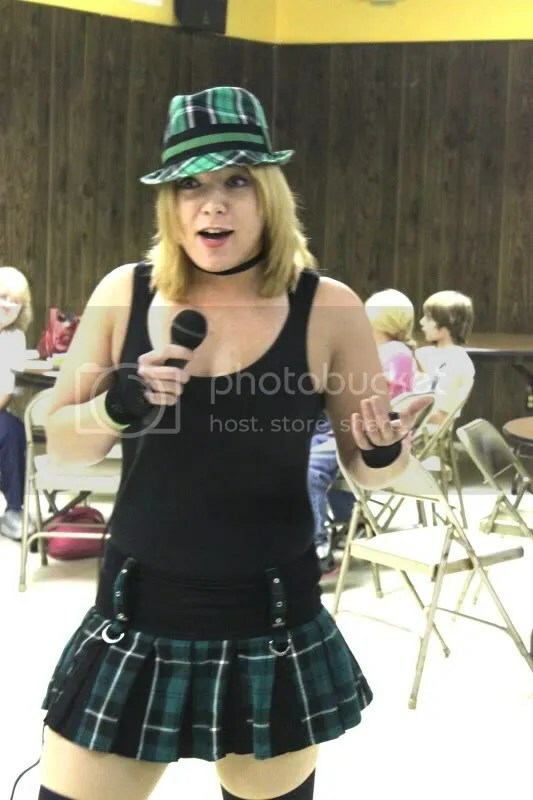 Tracy has been in WWE, WCW and ECW in his illustrious career. He is one of the most traveled wrestlers in the sport today. One of the famous Moondog’s. The Moondogs were known for wrestling in blue jeans, sporting shaggy blond hair and beards and carrying animal bones around with them (which they would chew on and use as weapons) Cujo would be honored with the Professional Wrestling Illustrated 1993 Feud of the year in 1993 when they thrilled fans with their matches with Jerry Lawler and Jeff Jarrett. Jason Vendetta vs. DaCobra in a ladder match. Eric Ruffington vs. Honky Tonk Man. 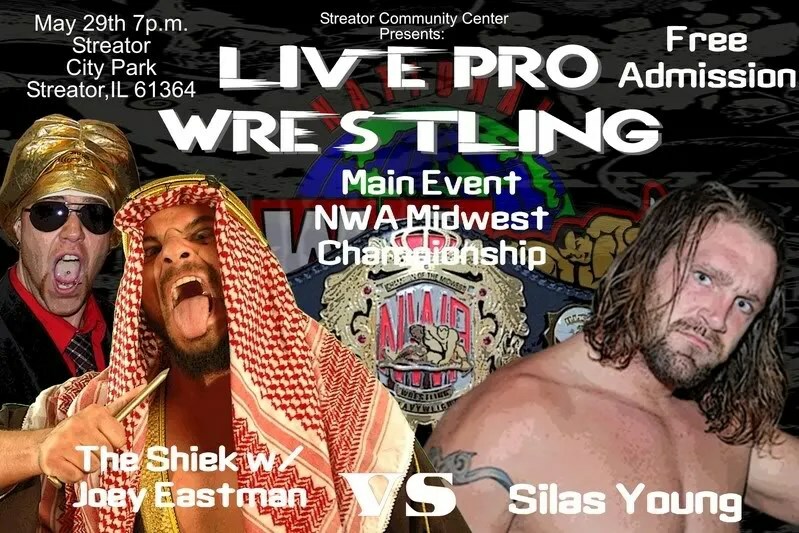 Blake Steel vs. Jake “The Snake” Roberts . 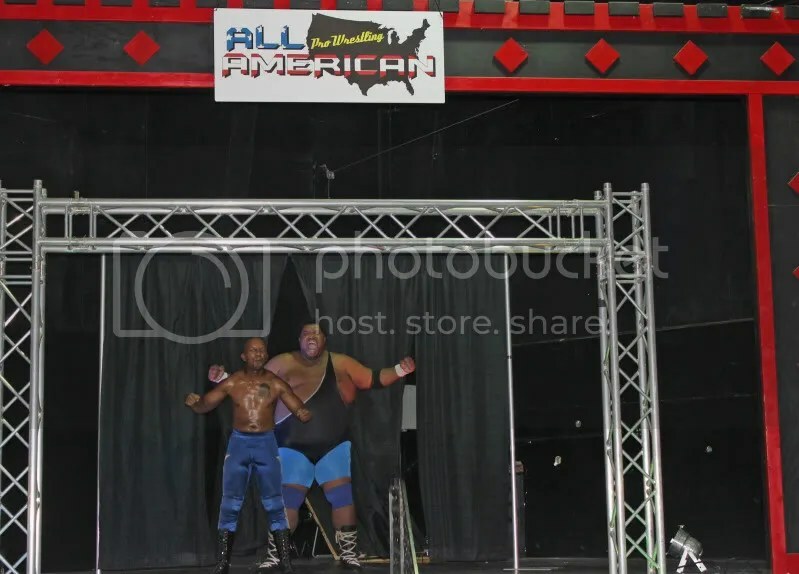 Fatal 4 Way tag team match….The Worlds Greatest Masked Team (Cheapshot McGrot & Cyclone) vs. Encore (D’Andre King & Vic The Pitbull Santelli) vs. The Killer Bee’s (Morton Von Prose/Jonathan Napier & Josh Powers) vs. the team of Wild Bill and Nicky The Weasel Mankotti. Plus a Title vs. Title Match between “Bloody” Harker Dirge and Issan Hadeev.